180-page eBook — broken down into 10 detailed chapters. Learn what to eat, when to eat, how much to eat. Complete with lists of foods, recipes, and diet plans to guide you through 30 days and beyond. Plenty of helpful charts, lists, links, tips, and printable worksheets to help you GET IN SHAPE FAST! 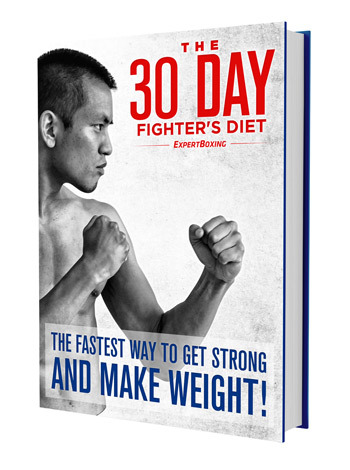 Fighters — get the exact diet plan to guide you from day one to fight day. Learn how to schedule meals around workouts, fighter’s supplements, what to eat on the day of the fight BEFORE & AFTER weigh-in. Get strong & make weight in 30 DAYS! THIS IS A DIGITAL EBOOK — no physical book will be shipped to you. The eBook is in PDF format, downloaded through the internet (available anywhere worldwide). There is a NO REFUND policy for all courses. I do not offer refunds for digital products once access has been given to the downloads. However, your satisfaction is my #1 priority, contact me and I’ll jump through flaming hoops to meet your needs. Please purchase responsibly and ask questions beforehand if you are unsure about this program for you.